It’s been countless years since you turned your back on civilization to go make your fortune. Your beard is down to your knees, your shirt has more holes than a wheel of Swiss cheese, and you’ve had it up to here with wrestling bears. But you just know that the oil is out there somewhere. You wipe your brow as you look up to the unforgiving desert sun, hike up your pants, and give your pickaxe one more swing before calling it a day. A brief calm melts before the ground below you begins to swell and rumble. Thin ebony rivulets start to puddle at your feet. This is the moment you’ve waited for. You bound out of your hole just in the nick of time as the earth beneath erupts into a geyser of black gold. Texas tea. Oil, that is. You sprint to the nearest town to stake your claim, and in only a few months you’re tanning beside the pool at your seaside mansion. Not bad for someone who dropped out of 1st grade, right? 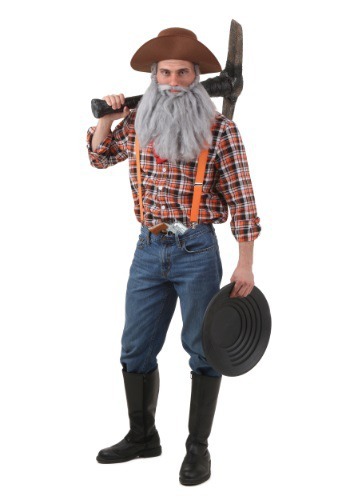 Our Prospector Costume will let you live out this roughneck vision of the American dream, back when fortunes were made in the real wilderness rather than the concrete jungle. After wearing this once you may just contemplate trading in your minivan for a burro and setting off for the Sierra Madre. What could be better than that? Bears aside, of course. So many bears.